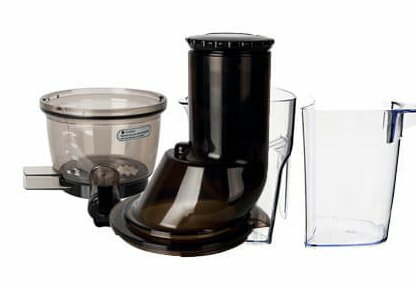 The new Kuvings B8000 Domestic Cold Press Juicer. Quiet Operation – the operating noise level of the Kuvings Whole Slow Juicer is which allows you to enjoy fresh juice in a relaxed and calm atmosphere. This long and narrow section initially cuts the ingredients and guides towards the lower section. ULTEM is a safe, Eco-friendly material that is durable enough to be used for aircraft and medical equipment. ULTEM is used in the juicing screw and the strainer of Kuvings Whole Slow Juicer. The wider section squeezes the ingredients against the strainer wall as it gets pushed downwards. 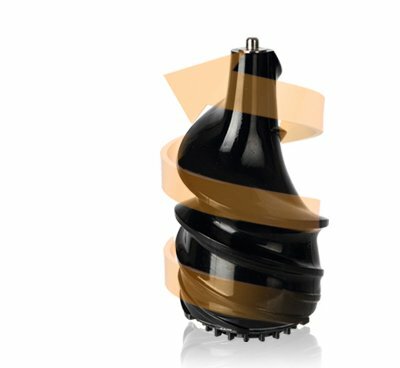 The space between the strainer wall and the juicing screw gets thinner towards the bottom; this design, paired with a very powerful motor, guarantees the highest yield. High-Performance in-house manufactured AC induction motor ensures consistent quality. The 240W high-performance motor runs silently and is able to juice even harder vegetables with the proper preparation. 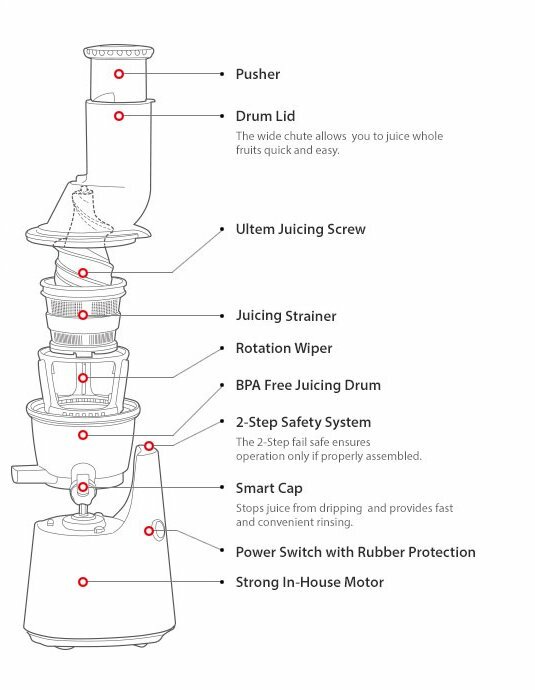 The Kuvings Whole Slow Juicer is also designed for safe operation. The built-in failsafe ensures operation only if properly and fully assembled. Additionally, three optimal placed heat-vents grant long time operation and an automatic heat control system will shut off the juicer before overheating.